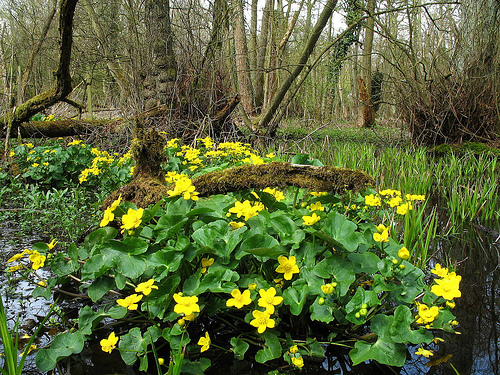 The ‘Beltaine flower’ Caltha Palustris (Marsh Marigold, Lus Buí Bealtaine) emerging in ‘curragh’ pools at Beltaine. The ancient Atlantic Gaelic seasonal festival of Beltane, Beltaine or Boaldyn (usually ascribed to the 1st May/12th May) celebrates the opening of summer and the burgeoning growth and fertility of nature. Before the second half of the 19th century, it was a great cause for public and domestic celebrations and observances in many rural districts of Ireland, Scotland, and the Isle of Man, as well as many districts is Wales and England. Seemingly coming down from prehistory, these seasonal May celebrations were characterised by hilltop bonfire parties, cattle-saining (prior to transhumance to the summer pasturage) and the celebration of foliage, flowers, fertility and water through various customary and superstitious observances. Was Beltane really a fire festival? The first example is very intriguing, as it states that ‘Bil’ was an ‘idol god’, and that ‘beltine’ means ‘fire of Bel’. This is slightly at odds with the definition given for ‘Belltaine’, as ‘lucky fire’. No connection is made of the bible’s Baal, however – this would come later. Wilde supposed, like many scholars of the 18th and 19thC, that Mayday Bealtaine was the original festival, transferred to the ‘christian’ festival of midsummer during the era of primary evangelism. That both occasions (1st May and Midsummer) were ones at which the smoke and embers from the celebratory fires were used in saining people, animals, fields and properties might support this, but it is evident that midsummer celebrations were of an equal significance in traditional paganism across Europe. The interval period between La Belteine (1st May) and midsummer was one in which cattle were typically driven to summer pastures, which would otherwise be inhospitable and sparse during the winter months. A god called ‘Beil’ and druids galore! His attitude towards fire-ceremonies and druid-savvy opinions were probably shared by a strong Irish contingent of contemporary Roman Catholic and Scots scholars exiled on the continent during the 16th and 17th centuries. The Scots had been first off of the mark in the new National History stakes with Hector Boece’s Historia Gentis Scotorum (1527), which made free license with the history of the druids, who Boece claimed took up residence in the Isle of Man after the fall of Anglesey to the Romans in the 1stC, and became educators of the early Scots monarchs. Scholars of the early modern era onwards were generally fascinated by the references to ‘druids’ in Caesar, Pliny etc, and could be guaranteed to find traces of them in the medieval manuscript texts of the Irish. For Keating (himself a Catholic priest), druids could provide further prestige to Irish history, which could already unarguably lay claim to being a leading light in christianising northern Europe. Had not the Irish converted almost seamlessly from paganism to christianity? During the 16th and 17thC English literature had sought to attack and demean the Irish, and Keating provided a positive (and Roman Catholic) narrative which he hoped would equal that of Camden. He was writing in an era noted as much for its ahistoric ‘druid craze’ as its efforts to establish some kind of stable orthodox history which promoted a notion of continuous progress from a barbaric unchristian past into an enlightened christian present. As a Roman Catholic he was all too aware that Protestantism frequently derided Catholicism as backward and superstitious. Druids appeared to early modern man’s mind as the ideal bridge from savagery into ‘enlightened’ christianity, and the Irish manuscript narratives (in particular the traditions of Patrick and the early Irish saints portrayed as ‘taking over’ from the ‘druids’) were the ultimate form by which this might be expressed. Martin was steadily enlarging the prevalent theme linking Beltaine with fire and fire-gods. The druid-concept came to its fuller popular fruition in the writings of another Irish author, John Toland, whose ‘A specimen of the critical history of the Celtic religion and learning, containing an account of the Druids &c’ was published shortly after his death in 1722, to much acclaim in certain circles. Many 18thC scholars and gentry, perhaps egged on by John Toland’s writings increasingly enjoyed identifying themselves with the ‘noble’ vision of ancient druids, who offered a closer-to-home vision of their ancient elite forebears, favoured over the previous desire to show sympathy with the great classical era Greek and Roman or biblical characters. After the custom of the day, they began to create the ‘neo-druidic’ fraternal orders which sought to establish some kind of continuity with the ancient mystical past of non-Roman, pre-christian Europe. Unfortunately, in so doing, they were also effectively censoring themselves from deviating from group-held opinions on what had really been going on among the ancient ‘Celts’…. These scholars with a love of all things ‘druidic’, were often (like Keating) of a religious background – literacy being greatest among the clergy. If not, they were steeped in the religious cultures of Protestant and Roman Catholic christianity. For this reason, they tended to attempt to fuse the contending interests in the history of ancient paganism with the biblical narratives. There thus developed in the 17th and 18thC a popular theory that Beltane was a remnant of a festival worshipping the Canaanite/Phoenician god Baal or Bel somehow transplanted to Britain by (presumably) Phoenicians in dim and dusty unknowable antiquity. When the Scottish laird James MacPherson published (in perfect English hexameter verse) his version of a supposedly lost ancient epic poem by the legendary Irish poet ‘Ossian’ (and son of Fionn Mac Cumhail), suddenly new visions of a hallowed ancient past to match those of Homer startled and galvanised the scholars and educated gentry of the European world. Anything seemed possible in an era already heady with the almost daily discoveries of science and exploration, and this led to a certain excessive credulity. The idea of Baal being worshipped at Beltane was given increasing force in the mid to late 18thC by antiquarians in Ireland, such as Charles Vallancey, who expounded a linguistic theory trying to prove that the Irish were descendents of tribes from the biblical Holy Land, who had bought Baal worship with them. Religiously, the Christian churches historically liked to portray ‘light’ coming from the East to the gloomy heathen West – part of a misguided popular narrative which believed humanity was continually bettering itself. The exploratory and empire-building Europeans of the 16th-19th centuries frequently came across and subjugated populations whose level of technical and social development they equated with their own ‘savage’ pre-christian past. The new awareness of examples in the east of immolatory human sacrifice (Suttee), along with the fire-ceremonies and corpse-exposure practises of the Zoroastrians reminded druid-crazed Europeans of the Greco-Roman propaganda about Celtic immolatory practices. This reinforced the notion of a primitive religion being about fire-worship, and the Beltane activities seemed to prove this link to ‘barbarism’, extending also into a Protestant polemic narrative against ‘primitive’ and ‘ungodly’ Roman Catholicism. In reality, the bonfires were not particular to Beltane in its various regional variants, and the practice of using smoke and fire to cleanse and bless is by no means specific to any one festival or religious/superstitous practice, being common across all religions throughout history. Bonfires were also special features of the other ‘quarter day’ and ‘cross-quarter day’ festivities in the traditonal and ancient Gaelic ‘wheel of the year’ celebrations. Samhain, Lammas/Lughnasadh, Imbolc and the celebrations of the Solstices and Equinoxes were also typified by fires. Beltane is not just about fire: Forgetting the theories of Canaanite fire gods and druidic immolations, we are left with a pretty large and diverse collection of folkloric accounts of Beltane and Mayday practices from Britain, Mann and Ireland, which demonstrate it was a celebration of a complex set of natural forces. Fires were certainly an important element (as they are for any good communal feast or activity), but there is absolutely no reason from evidence to suggest that they were the core defining aspect. The collecting, carrying and displaying of foliage and flowers was a particularly important and widespread aspect of customs, which is unsurprising given that the beauty of surging vegetation is characteristic of the season. Water was also important, as was the ascending of mountains and hills, where it is likely to be found. In late spring and early summer of Atlantic Europe, the combination of sunshine and rain in equal measures ensures that greenery is a potent and visible feature of the landscape, typified by the acceleration of vigourous vegetative growth in herbaceous plants, and the explosion of blossom and leaves on trees. This offered ancient peoples with a significant reliance on animal-herding in their rural economies (such as the Irish and Britons) opportunites to exploit burgeoning upland pasturage once the threat of harsh weather had receded. This coincided with better access to turbary (cutting turf/peat for fuel) and the hunting opportunities offered by movement of herds of wild deer and birds etc to the same upland pastures, as well as the movement of fish up rivers to spawn. It is perhaps no surprise that many records of older Beltane festivities involve the ascending of hills and creating of fires upon them. Of course, hills or mountains are not just good summer sources of food for man and beast, but are also often the sources of streams and rivers which proceed downwards from them and across the land and to the sea. Often saturated with rain and cloud they are great sources for the rivers which nourish the lowlands, and – excepting the morning dew – there is nothing clearer and purer than a mountain spring, just as there is nothing muddier than estuarine waters. To the ancients, mountain springs were therefore a special source of water, just as the mountains themselves attracted a special accretal of mythology, legend and spiritual importance. It is unsurprising that both dew and spring wells enjoyed a special prominence in ancient May traditions. “… Wells, whether blessed by saint, or consecrated by pilgrim’s rounds, or merely furnishing the healthful spring are objects of especial care and attention at May time, and in former years were frequently watched all night, particularly in pastoral districts, to ensure them against being skimmed with a wooden dish or cuppaun by some butter abducting hag as the sun rose on May morning. This was called ‘taking the flower of the well’ and the words “Come butter come” were then repeated. The idea of ‘taking the flower of the well’ echoes the English Mayday-tradition of well-dressing or ‘well-flowering’ in which wells were anciently decorated with flowers. Such collective efforts at beautifying wells and springs are believed to have an ancient pagan provenance, and removing items from such religious sites would have been associated with bad luck or an attack on the common good, as suggested by the well-skimming ‘witch’ stories common across the Gaelic world. In the same way, the removal of rags and ribbons left at ‘clootie wells’ has long been considered unlucky. Wells and springs represent the returning of waters to the land, and waters flow in a branching manner (from branch to trunk to roots) redolent of the form of trees and vegetation whose growth is celebrated at Beltane, represented in Ireland and Britain by ‘May bushes’ and ‘May poles’. The heat of the sun is only fertile when combined with the moisture of water spouting forth from the sky and earth. I am pleased to share this wonderfully insightful piece from Daphne Kyrene on her excellent ‘Lykeia of Apollon’ (‘Beloved in Light’) blog: It covers the mythical relationship between Apollon, Delphyne/Python and the legend of Helios, Phaethon and the Heliades.